I'd like to compile a table of all the different combinations of MJ driveline and the length of their rear driveshaft. I need bed length, engine, trans, 2wd/4wd, rear axle and then the length of the rear shaft from center of U-joint to center of U-joint. Automatic Trans., Kanda P.t. Trans. 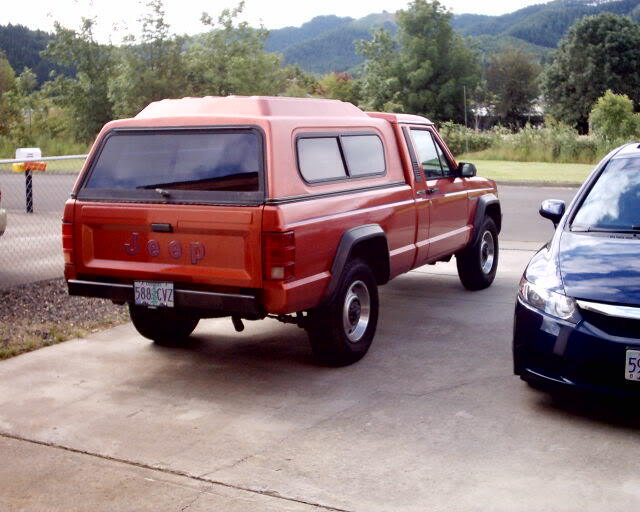 '86 lwb, 2.8, tf 3speed, np207, d35 = 54"
lwb, 4.0, AW4, NP231, D44 = 48"....d35 = 47"
lwb. 4.0, ax15-ba10/5, np231, d44= 49"....d35 = 48"
lwb, 4.0, aw4, np231, d44= 48" d35 = 49"
lwb, 4.0, ax15-ba10/5, np231, d44= 49" d35 = 50"
swb, 4.0, aw4, np231, d44= 41.25" d35 = 42.35"
swb, 4.o, ax15-ba10/5, np231, d44= 42.25" d35 = 43.25"
can someone re confirm? sorry for the above confusion. amc20 vs d35 snout difference?? 4 BANGERS AND 2WD SPEAK UP! I'll try to get some numbers off my 86 (4x4/2.8/stick/AMC 20) tomorrow. 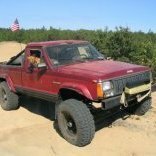 89, SWB, 4.0L, AW4, 2WD, D35 = 53 1/8"
i wasnt disputing your numbers but those of shelbyluvv or comanche09 because they both had the same drive shaft measurements and different trannys, which are an inch different in length. meaning there should be a difference in drive shaft measurements.... unlesss they have different length tailpiece :dunno: anybody? You didn't know because it didn't come with it. The 2.5 was offered with an AX-5 or AX-4. The only way to get an AX-15 behind a 2.5 is to use a 93+ 2.5 5 speed Dakota bellhousing. The later 2.5 Dakotas were offered with the AX-15... but not very many. I measured it last night. It is the stock shaft out of my truck. There may be a 1/8" here or there but that is what it measured to be. Add to the confusion some more. Getting a little annoyed at being doubted by my claim of a AX15 in my '89 with 2.5 I went out and checked. First moved the truck to get it out of the snow. Second raised it up high enough to get under it. Checked the manual to determine a sure fire way to ID a AX5-15. Crawled under truck.cold water immediately began dripping down my neck. Measured gearbox. 16 1/2 inches. End of fact finding tour.Scrapeing grease off surrounding area revealed a 3/4 inch (approximate) aluminum plate between tran and bell housing. Does not look original. To cold to do any more came into house and warmed up. As soon as I get the CJ3 I'm working on out of the garage the MJ is going in for further analysis to confirm a growing suspicion. Jim By the way, have 5 MJ driveshafts. They ALL have the sticker on them. Rear ones, Don't know about the front. ax15-ba10/5 (same length) are 1" shorter than aw4.... I'm thinking this is true of the 4x4 trannys and the tailpiece of the 2wd ba10/5 is 1" longer than the one on the aw4 which would make the drive shafts equal in length. 2WD LWB w. AW4, 4.0, & D35 = 60" length u-joint to u-joint. I finally remembered to go measure my 4.0L/AX-15/4wd/dana35 and I got 43.5"
2WD LWB w. AW4 = 60" length u-joint to u-joint. lwb, 2.8, tf 3speed, np207, d35= 54"
lwb, 4.0, aw4, np231, d44= 48" d35= 49"
lwb, 4.0, aw4, 2wd d44= d35= 60.5"
lwb, 4.0, ax15-ba10/5, np231, d44= 49" d35= 50"
swb, 4.0, aw4, np231, d44= 41.25" d35= 42.35"
*swb, 4.0, aw4, 2wd d44= 52.125" d35= 53.125"
swb, 4.o, ax15-ba10/5, np231, d44= 42.25" d35= 43.25"
*swb, 4.0, ax15-ba10/5, 2wd d44= 52.125" d35= 53.125"
lwb, 2.5, ax5 d44= 63.75" d35= 64.75"
@swb, 2.5 ax15 d44= 57.75" d35= 58.75"
swb, 2.5 ax4 d44= 57.5" d35= 58.5"